Cool! 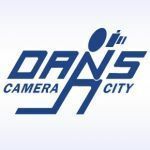 Save an average of 20% on Dan's Camera City with 2 Coupon Codes, and 13 Deals! Online sales of digital cameras and other accessories. get 8x10s matte or glossy prints for 99¢. Details: Get 8x10s matte or glossy prints for 99¢. Details: 50% Off All iPhone 4 & 5 Cases. Ends 08/19/2013 10.00 AM CST.